HOUSTON (October 5, 2018)– Thursday afternoon a major crash involving an 18-wheeler and thirteen vehicles near Kingwood closed all northbound lanes on I-69/Eastex Freeway. Rush hour was backed up for miles and the freeway was closed for hours. 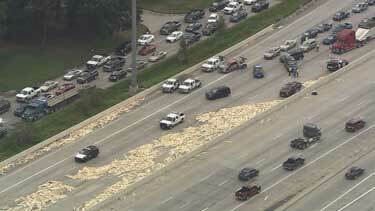 According to Houston Police, around 4:30 p.m. the 18-wheeler lost a load of lumber that scattered across all the lanes on the freeway. 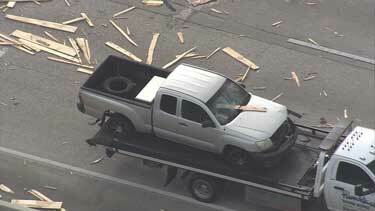 Pieces of wood crashed the font windshields of several vehicles. There were no injuries or fatalities reported. Crews worked for hours picking up piles of lumber and debris. At this time there is no certainty how the lumber became loose from the trailer. Houston police state the multiple car accident is under investigation. If you or a loved one were involved in multiple car collision, it is important to contact a legal expert to help you evaluate your options. Call (713) 987-7111 or send us an email to discuss your car accident injury case.